LinkedIn has been called the Facebook for professionals… or MySpace (dated reference) with ties. From humble origins, it has grown to become the premier professional networking site, par excellence, throughout the internet, and despite the company’s various attempts to hide its more useful features, especially for job seekers and recruiters, behind pay walls and “premium accounts”, for the most part it is still free and open and certainly one of the best tools a passive or active job seeker has available. However, as anyone who has been a member for any length of time (and received the countless spam messages from sales and marketing professionals in India) will know, LinkedIn can be used properly and then it can be abused and what goodwill you might have generated may be quickly squandered. Nothing like putting your foot in it when thousands of people are watching. And the more connections you have collected, the more opportunities there are for that grand faux pas that has sunk the career of more than one actor, politician, sports star, and internet thug on Twitter or Facebook. Follow a company. You will get updates on who in your network moved where. While it’s interesting to see who the “New Hires” are, more important is where they came from, as these might point toward openings at their old company. Also note what their new positions are to get an idea of a possible career path. And, of course, a company’s “Recent Departures” list also lets you know of openings. Mine new contacts for even newer ones. Every time someone connects to you, look through his or her list of contacts. View the profiles of those that intrigue you, and reach out to a few of them, citing things like common interests, schools attended, and shared company experience, or even just mention photos they’ve posted… LinkedIn allows people to put up so much content — slide shows, groups, awards, reading lists, articles, blogs, Twitter streams — it’s very easy to find a common reason to connect. Connect with highly visible people. Search on terms like “speaker,” “author,” “writer,” “coach,” “trainer” “evangelist,” “sales,” “keynote,” “award-winning,” or “expert.” These people are often uber-connectors with thousands of connections. When you find one in your field (or a related one), search for him or her on the Web to find something he or she has written, and send a thoughtful comment or compliment. Make sure it’s sincere. If you get a good response, follow up with an invitation to connect, but don’t pester the person if he or she ignores you. These well-connected types are very busy people. A visit to the person’s Website might reveal an upcoming speaking engagement in your area. Whatever you do, respect an uber-connector’s time. Recruiters are in their own category; they often have connections in the thousands and knowledge of job openings, but they are also overwhelmed. If you contact them, make sure you give them a good reason to link and try to be memorable. Connect to “interesting” people. Search on an unusual interest of yours to see who else has it. You might get ideas about career direction, or a contact might be able to give you a job lead. Imagine you’re a medical assistant who likes dancing. A search on “flamenco dancer” brought up this title for one person: “Medical Doctor, Wellness Expert, International Speaker, Life Coach, Author & Flamenco Dancer.” You could reach out to say, “Wow, another person in health care who loves flamenco!” It’s a long shot, but life is made up of such coincidences. Leverage even weak links. I once got an interview by sending a message through LinkedIn to one of my contacts, with whom, truthfully, I was only loosely connected. Not only was she someone I’d never met in real life, but I’d turned her down for an interview! (I got a job offer elsewhere.) A year after our initial connection, I was job searching again, and I noticed she was connected to someone I was targeting. It was gutsy of me to do, but I felt I had nothing to lose, so I contacted her. She forwarded my resume, and I got the interview. 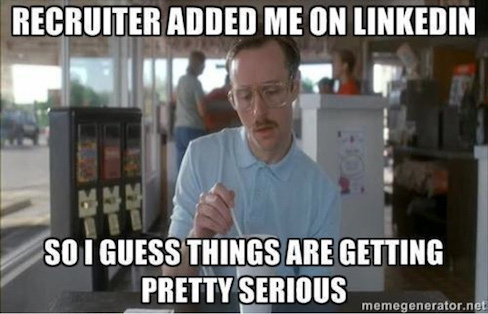 Some people are keen to update their profiles to “Job Seeker” or put something rather desperate sounding in their current title or job description (like “Looking for the Next Great Opportunity!” or “THE Candidate You’ve Been Looking for!”). Always seems a little desperate and likely to attract the wrong sort of attention from recruiters and hiring managers. While it’s always good to be honest about your current job status, no need to wave around being unemployed like dirty underwear. Get started on LinkedIn BEFORE you are out of work, so you have the resources in place beforehand and it doesn’t look like you’ve joined or become suddenly active only because you’re looking for a job. Then you’re free to use LinkedIn like your online resume for both passive and active opportunities that come up. This entry was posted on Wednesday, April 27th, 2016 at 6:27 pm	and is filed under job search. You can follow any responses to this entry through the RSS 2.0 feed. You can leave a response, or trackback from your own site.